DaVinci Resolve is a bit of a unique applications as it is able to heavily utilize the GPU (or multiple GPUs) to greatly improve performance. We tend to use NVIDIA cards in our workstations as they typcially give better performance in professional applications like Photoshop, After Effects, and Premiere Pro. However, given how much Resolve leverages the GPU we wanted to see how the AMD Radeon Vega video cards compare to the NVIDIA GeForce cards in DaVinci Resolve. It is worth noting that while we will be focusing on DaVinci Resolve performance in this article, choosing a specific GPU to use is a much more complicated topic. Many other factors including current pricing, reliability, power draw, noise level, and available cooler designs are all things that need to be considered. Something else we want to mention is that while many Resolve workstations will utilize multiple video cards, we will only be testing single GPU configurations in this article. We have done plenty of testing on GPU scaling in Resolve and what we have found is that the scaling is pretty similar between different GPU models. It is possible that AMD cards will scale slightly differently than NVIDIA, but it is pretty unlikely. In addition, there are very few AMD Radeon Vega models (both in terms of existence and consistent availability) that have a rear-exhaust cooling system. Having a rear-exhaust model is extremely important to help vent the heat caused by multiple video cards and while you could brute-force a solution by using more powerful (and louder) chassis fans, that is not a great solution. This CPU, RAM, and storage combination we are using is among the best you can currently get for DaVinci Resolve which should give each GPU the chance to perform to the best of its ability. To compare AMD and NVIDIA, we chose a wide range of cards from both the Radeon and GeForce lines. We also decided to include the NVIDIA Titan cards even though they are well beyond the pricing of the AMD cards because we actually sell a decent number of Resolve workstations with Titan cards so this is simply to help show the top-end performance you can get out of a single GPU. We do want to point out that at the time we did this testing, it was difficult to source a quality AMD Radeon Vega card that was not factory overclocked. Rather than delaying our testing we decided to go ahead and use the overclocked cards even though it will slightly skew the results in favor of those cards. 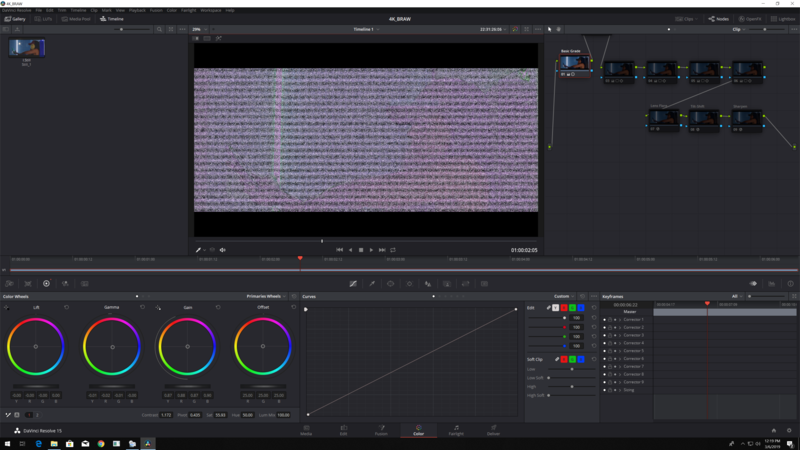 Our testing for DaVinci Resolve currently revolves around the Color tab and focuses entirely on the minimum FPS you would see with various media and levels of grading. The lowest level of grading we test is simply a basic correction using the color wheels plus 4 Power Window nodes with motion tracking. The next level up is the same adjustments but with the addition of 3 OpenFX nodes: Lens Flare, Tilt-Shift Blur, and Sharpen. The final level has all of the previous nodes plus one TNR node. We kept our project timelines at Ultra HD (3840x2160) across all the tests, but changed the playback framerate to match the FPS of the media. For all the RAW footage we tested (CinemaDNG and RED), we not only tested with the RAW decode quality set to "Full Res" but we also tested at "Half Res" ("Half Res Good" for the RED footage). Full resolution decoding should show the largest performance delta between the different cards, but we also want to see what kind of FPS increase you might see by running at a lower decode resolution. For the rest of this article, when we mention AMD versus it's equivalent NVIDIA card, these are the models we will be talking about. The "Score" shown in the chart above is a representation of the average performance we saw with each GPU for this test. In essence, a score of "80" would mean that on average that card was able to play our project at 80% of the tested media's FPS. A perfect score would be "100" which would mean that the system gave full FPS even with the most difficult codecs and timelines. With that said, we saw almost no difference between any of the cards with our relatively light testing with just a basic grade and four Power Windows. Really the only reason each card did not score a perfect 100 was due to the 8K RED Full Resolution test where most cards achieved ~20 FPS rather than 25 FPS. Adding three OpenFX nodes is where we really start to see a difference between the different video cards. Using the rough pricing equivalents we discussed at the start of this section (RX 580 ~ GTX 1060, Vega 56 ~ GTX 1070 Ti, and Vega 64 ~ GTX 1080), we found that the AMD Vega cards were on average 20% faster than their GeForce equivalent. This is much more than we expected and a very strong performance from AMD. However, it is worth keeping in mind that the higher-end cards from NVIDIA like the GTX 1080 Ti or Titan cards can be anywhere from 13-35% faster than the Radeon Vega 64 - assuming you have the budget for them of course. Adding a TNR node allows the AMD cards to pull a bit further ahead. In this test, the AMD Radeon Vega cards ended up being about 25% faster than their NVIDIA GeForce counterparts. The performance gain with the higher-end NVIDIA cards is lower than it was in the previous tests with the GTX 1080 Ti only being about 5% faster than the Vega 64, but the Titan cards can still be 15-33% faster than Vega 64. One thing we do want to point out is that the GTX 1060 6GB card consistently caused Resolve to crash when we tried to do this test on 8K RED media. For this test, the 6GB of VRAM is simply not enough to keep up. On the other hand, if you are working with 8K RED footage and applying Temporal Noise Reduction nodes... you really should invest in a much faster card with more VRAM! Using the same rough pricing equivalents we used in the previous section (RX 580 ~ GTX 1060, Vega 56 ~ GTX 1070 Ti, and Vega 64 ~ GTX 1080), we found that the AMD Vega cards average out to being about 10% faster than their GeForce equivalents. It is worth noting that the more intense the grading we applied, the greater the performance gap became to the point that with our most intense test the AMD Radeon cards were closer to 30% faster than the GeForce cards. The fact that we had to test with overclocked AMD Vega cards may skew things a little bit, but likely only by a few percent. Something we do need to point out, however, is that even the Radeon Vega 64 is really more of a mid-range card for DaVinci Resolve. If you are looking for the best performance, the slightly more expensive GTX 1080 Ti will be about 6% faster on average than the Radeon Vega 64. And if you have a larger budget, the Titan Xp and especially the Titan V can give even higher performance in Resolve. So does this mean we will be listing AMD Radeon cards on our DaVinci Resolve workstations? Actually... no. The AMD Radeon cards give amazing performance for their cost in DaVinci Resolve and if they are what fit within your budget you should definitely consider using them. However, there are two main reasons why we won't be listing them in our own Resolve workstations. The first is simply because every single Resolve workstation we have sold over the last year has used a GTX 1080 Ti or higher GPU. That isn't to say that every Resolve user has the budget for a GTX 1080 Ti, but rather that our customers in particular overwhelming do have that budget. The second reason is related to the fact that there are very few AMD Radeon Vega models (both in terms of existence and consistent availability) that have a rear-exhaust cooling system. This usually isn't a factor if you only use a single GPU, but the majority of workstations we sell for Resolve actually have two or more video cards. Having a rear-exhaust model is extremely important to help vent the heat caused by multiple video cards - especially considering the Vega cards draw significantly more power than their NVIDIA counterparts. While we could brute-force a solution by using more powerful (and louder) chassis fans, that is not something we consider acceptable. Overall, this is a huge win for AMD. After doing similar testing in Photoshop, After Effects, and Premiere Pro and seeing NVIDIA coming out slightly on top in each of those applications, it is great to see the potential of the AMD Radeon cards being realized. Unfortunately, what is largely holding back AMD is the fact that they don't have higher-end consumer models which can really match the upper end NVIDIA cards and that most of the models readily available on the market are not optimized for multi-GPU use. version and Studio version are both available at http://www.blackmagicdesign...."
Can you please test DaVinci Resolve 15 now that it's out of beta test? hey! Its time for 1080ti vs 2080ti vs Vega in Resolve 15? We definitely be testing the 2080 and 2080 Ti as soon as we can. Last I heard we should be getting in some 2080 cards today, but the 2080 Ti we can't get our hands on quite yet. Hopefully it won't be too long, but it completely depends on availability. Yep, Resolve 15 is definitely pretty high on my to-do list. I have a few other projects I need to get done first, then that is next up - hopefully I can get testing done in the next few weeks.. It will probably just be color grading performance in this round, but in the future I would love to include some benchmarks for Fusion as well now that it is fully integrated. Can you test the new Nvidia Turing GeForce cards too in the various benchmarks you do, Resolve, Premiere Pro etc? We definitely will once they are launched. Generally, we tend to have articles up anywhere from right on launch day to ~2 weeks after launch depending on whether we are able to get samples pre-launch or not. "We are pleased to announce the release of DaVinci Resolve 15.0.1." "We are pleased to announce the release of DaVinci Resolve 15.1"
Your tests are great but I wondered why you never tested the AMD Radeon Pro WX 9100 16GB. Its not much more expensive than the RTX 2080 Ti. I have no personal experience of the WX 9100 16GB but it seems like it out performs the RTX 2080 Ti in terms of real time noise reduction filters and multiple grading/FXs. I have been through all of your video card bench marks test I believe but no card you have tested was able to do that (unless I have misunderstood some thing). Always, always, always take claims made by hardware manufactures (whether it is AMD, Intel, NVIDIA, or anyone else) worth a grain of salt. They all love to say things like "real time" without really getting into what they are doing. Notice how he talks about adding noise reduction and blurs, but never mentions the resolution, codec, or FPS of the footage they are using. That said, we are planning on testing the Radeon Pro series, we are just waiting for the RTX Quadro cards to become available so we can do a full "workstation" class GPU roundup. Something to keep in mind though, the Radeon Pro WX 9100 is almost identical to the Radeon Vega 64. In fact, according to AMD, the Vega 64 should actually be a hair faster. All you get from the WX9100 is more VRAM (which is useful for 8K footage, but won't impact raw performance) and presumably higher reliability and driver/software support. We'll have to wait for our benchmarks, but from everything I see I can't imagine how the WX9100 will be able to beat the RTX 2080 Ti - it should be closer to the RTX 2070 than anything else. What I can clearly see here is that the Radeon Vega 64 is a terrific value for Davinci. The 1080 Ti can be priced easily 50% more than Vega 64. It's easy to recomend it for single GPU systems. I'm a bit surprised you don't come to the same conclusion. And you even get 10 bit out of the box, unlike Nvidia Geforce cards. 1) By far, the majority of our customer's starting point is around a GTX 1080 Ti (or a RTX 2080 now). That is simply the point where they are getting the minimum performance they want, so going down to a Vega 64 just doesn't give them quite what they need. 2) Like you stated, the Vega 64 is really only ideal for single GPU configurations since there are almost no "blower style" Vega cards out there. Right now, around half the systems we sell for Resolve are configured with at least two GPUs from the get-go, and most of the rest have notes saying that the customer is likely to add a second GPU in the future. So for our customers, using a GPU that won't work well in multi-GPU configurations isn't going to work. Something else that has come up since the launch of the NVIDIA RTX cards is that the promise of NVLink functionality is further drawing us towards NVIDIA over AMD. Resolve doesn't support it yet, but when the do it should either provide a further performance boost with multiple GPUs or allow for things like memory pooling between cards. Not trying to argue but I actually didn't say Vega is good *only* for single GPU systems. I'm saying those are well served by a Vega GPU. On the other hand, I can easily find blower style Vega 64 units. I've been an Nvidia user like forever, but it's been your numbers what convinced me the next card in my Davinci workstation will be a Vega 64. If it is enough for you, then go for it! All I meant is that for the majority of our customers, even a single GPU isn't enough to cover what they want so we tend to pretty much use NVIDIA RTX 2080 and above exclusively at this point. Something I failed to mention about the supply of the blower style models is that while you can find them, getting more than a handful at a time can often be very difficult. It looks like supply might be OK at the moment, but I know we have run into big issues if we needed to get 10 or more at a time. For people buying one or two for themselves it isn't a big deal since you can just wait or buy a different brand if you need to. For us, however, that kind of supply inconsistency is really, really tough to handle. It looks like there are more blower style Vega 64 models available now. At the time of this article (and even just a few months ago), there were only one or two models listed anywhere and they had very minimal availability. This is definitely a good thing - the move NVIDIA made to making the reference RTX cards a dual fan design has been pretty problematic for us since we tend to do quite a bit of multi-GPU configurations for software like Resolve. Great review by the way Matt...i agree many never mentions stats what codec or debayering setting when the so call "4K" system builder on Youtube...most just show the render output time and stuff never mention what they are doing on the playbackside setting and stuff..
Actually doing that testing right now, but it will be with Resolve 15.2.4. Almost done with the testing, so I don't want to have to start all over. Did some spot checks though, and at least with what we test there is no difference in performance between 15.2.4 and 15.3. Blackmagic puts out such frequent updates that it is really, really difficult to always do our testing on the latest version. I have run into an issue with the AMD drivers causing major artifacting with BRAW footage that I still need to sort out though. It happens with both the Radeon VII and Vega 64, so it isn't due to the card itself, but the driver. Worst case, I'll skip that test if there isn't an older AMD driver that works with the Radeon VII that doesn't have the issue. Apparently AMD isn't the only ones with driver issues. Looks like one of the newer NVIDIA drivers is causing up to a 5 FPS drop in Resolve. So... maybe I will go ahead and update to 15.3 since the results I have right now don't look like they are 100% valid for either AMD or NVIDIA.